Designed to be compact and light weight, the RANGER 2 is optimized for CQC scenarios. 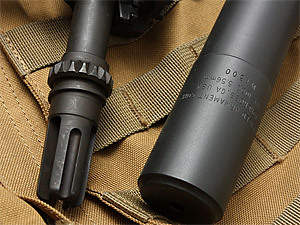 Replacing the standard flash hider, the simple thread mounting system provides rigidity and strength for increased accuracy while minimizing the repeatable zero-shift. Extreme durability is achieved by fully CNC automated fusion welding every high-temperature component used in its construction - giving the RANGER 2 longevity and making it an excellent value. The back-pressure lowering design of the silencer aids in shooter comfort, reduces weapon fouling, and minimizes cyclic rate increase. The elimination approximately of 95% of the muzzle report nullifies the need for ear protection, preserves field communications, and masks the location of the user. The combat proven fast-attach mounting system of the new M4-1000 silencer provides reliable precision accuracy with minimal & repeatable zero-shift. Users have the ability to install or remove the silencer from the Blackout™ flash hider within seconds while being subjected to the harshest environments. Extraordinary sound & recoil reduction are two of the instant benefits of the M4-1000. Durability is maximized by CNC automated fusion welding of the components used in its construction- giving the M4-1000 longevity & making it an excellent value. The back-pressure lowering design of the silencer aids in shooter comfort, reduces weapon fouling, & minimizes cyclic rate increase. The outstanding reduction of the muzzle report nullifies the need for ear protection, preserves field communications, & masks the location of the user. The affordable M4-1000 is lighter & more durable than competing designs, while maintaining all of the features that have made the M4-2000 so popular. The Mini4 is the result of a request for an ultra-compact can for 5.56mm rifles and carbines. The Mini4 features the same fully welded all-Inconel® guts as our M4-2000. With an overall weight of 13 ounces and adding less than 3 inches to the overall length of the host weapon, it is easy to disregard the Mini4 until the shooting starts. Despite its compact dimensions, the Mini4 reduces the muzzle signature below the 140 decibel threshold at the shooter's ear and dramatically reduces visible flash. NEW for 2011, T.H.O.R. (Thermal High Order Radiant) 100% Titanium, high penetration 360 welded. 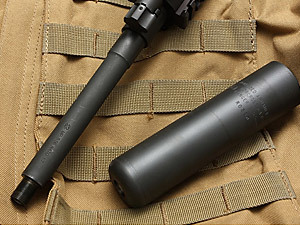 One of the world's most advanced suppressors! Extraordinarily accurate, light, strong and quiet, this is the choice of some of the most demanding clients throughout the world. AWC Raider™ maintains its place as one of the world's most advanced combat suppressors. In 2011, the all new T.H.O.R. variant of this suppressor has already shipped to the U.S. Marine Corps and a number of law enforcement agencies. Light enough to maintain accuracy, strong enough to sustain full auto fire. Historically, the Raider™ has been produced under contract for the U.S. Marine Corps, U.S. Army, U.S. Air Force, and U.S. Air Force Special Warfare Units and has also been acquired by the U.S. Navy for Specific Users. The TREK is our shortest, most rugged threadmount suppressor: a 5.56mm unit suitable for full auto and usage on modern, shorter barrel (10.4" or greater) carbines. The quietest of the Gemtech threadmounting suppressors, it also features a short profile that keeps compact carbines compact. The TREK is made of rugged stainless steels and inconel, with welded construction. TThe TREK-T is our shortest, 5.56mm titanium suppressor: Its tough construction is suitable for full auto and usage on modern, shorter barrel (10.4" or greater) carbines. The TREK series of suppressors are the quietest of the Gemtech threadmount units, but while this compact, lightweight can makes no compromises on sound reduction, its short profile keeps compact carbines compact. The TREK-T weighs in at a featherweight 10.3 ounces - subtracting the couple ounces and inches of flash hider removed from the host rifle, this gives a net gain of only around 8 ounces - a small weight penalty to pay for OSHA safe hearing protection mounted on the weapon at all times! 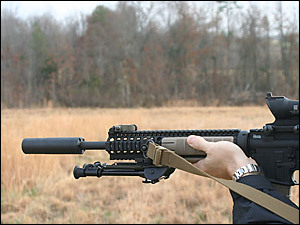 The HALO is our true "grunt" suppressor – rock solid, easy to use, and requires no modification to the host weapon. 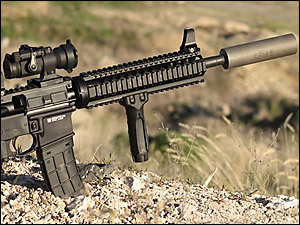 It utilizes a simple, patented, no-tools mounting system that slips over most NATO weapon 5.56mm flash hiders. There is no need for proprietary mounts or modifications to the barrel. 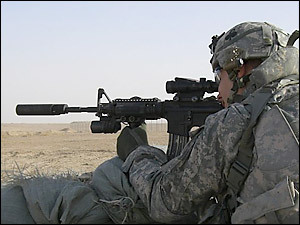 It may be swapped between many different weapons easily, including the M16, M4, HK416, and M249. HALO's have earned a reputation as a product of exceptional quality at an absolutely fair price. Welded construction alone isn't enough – the HALO is a fully welded inconel and stainless suppressor core encased in a stainless shell for double-walled security and impressive longevity. If you break things for a living, this is durable enough to be your can. Birthed for battle, the HALO has proven itself in conflicts around the globe. As technology has advanced, the combat-proven HALO has been improved by trimming weight and length while retaining the same excellent dB and flash reduction. The patented mounting system utilizes the 22 mm standard NATO-specification bird-cage type flash hider as used by the military worldwide. Mounting or removal can be performed without the use of tools in less than 30 seconds. The suppressor comes with detailed instructions for installation and use. It also includes a peel washer for remounting of the AR15/M16 flash hider should the original flash hider be mounted with a crush washer. If you want "high speed, low drag" this is it. Every component of this suppressor has been critically assessed, shot hard, improved upon, thought through, and tested tough to become the new standard in 5.56mm quick mounting suppressors. Lighter, stronger, quieter, more durable and maintenance-free, the G5 is made for those that demand the apex of performance. Titanium, stainless steels, and inconel are mated throughout the G5 to ensure the right material for each task. It adds 5.5 inches to the overall weapon system length, affixing over our Quick-Mount flash hider – an easy push and twist that may be done wearing gloves, in any weather condition, and in total darkness. The mount provides repeatable POI shift each time it is mounted. The barrel portion of the mount is torqued into position to assure utmost accuracy. 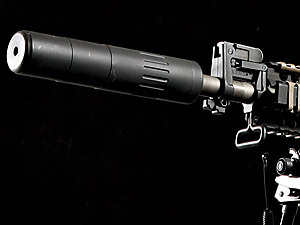 By utilizing additional flash hider mounts on a variety of weapons, the G5 suppressor can be quickly, easily, and securely moved from weapon to weapon as the situation requires. The G5 Quik-Mount retains compatibility with the older Bi-Lock mounts. Mounts to a standard mil spec A2 flash hider with no modifications to the host weapon. The Renegade mounts in seconds using the SAI Gas Seal Lock and Twist mounting system. All welded construction. At only 6" long the Wolverine is the perfect companion for entry carbine length 5.56mm rifles.